Apparently the FullSpeed TinyLeader has all the features that could make it the Best brushless Whoop. It has ducted blade guards, protective canopy, versatile FSD408 flight tower and high quality FPV camera. Over the last few years, we reviewed many Tiny Whoop alike micro FPV drones including the genuine Blade Inductrix FPV Plus. The ducted blade protectors not just improves the efficiency of the propellers, but also makes the aircraft very safe for indoor practice. FullSpeedRC announced their TinyLeader 75mm in 3 variants. According to your existing transmitter you can opt for DSMX, FlySky or FrSky radio receiver. Furthermore, they also offer a “HD” version with 1080@60fps on-board recording. Optional Frsky, Flysky or DSMX radio receiver. Disclosure: I received this drone from GeekBuying, in order to test it and make an in-depth review. Although the quadcopter was offered for free, all opinions in this review remain my own and I was in no way influenced by my partner. I start to believe that DHL is totally incompetent. Till now I had problems only with the packages which came from China, but now it seems that they are not capable to deliver in-time within Europe. While the package was collected on January 21, 2019 I receive it only on February 08. By car you can travel easily those 1700 km in 3 days not 3 weeks. Anyway, I should probably happy that my FullSpeed TL visited so many beautiful European cities: Amsterdam, Eindhoven, Athens, Bologna, Milan, Linz, Budapest, Bucharest and Budapest again :). First contact with the FullSpeed TinyLeader, was quite disappointing. Opening the box I found that no spare props nor flight battery included. Not even a user manual, just some useless FullSpeed stickers. How could expect GB to test the drone without a compatible LIPO?! At least they should warned me about this fact to have time to order one. Luckily one of my friend had a compatible LIPO and bring it to me quickly. Due to its white&yellow color combination, the FullSpeed TinyLeader reminds me about the KingKong Tiny7. The 3D printed canopy has more design function than protective one. Camera lens as well as most electronic parts are exposed during crash. Behind the canopy’s shark tail is located the VTX antenna. Micro USB firmware port is found on right side of the FSD408 flight controller. No lights, but not an issue till you stay FPV. For LoS (line of sight) flights I suggest you to install a bright LED light. In order to be light and strong, it mixes carbon fiber elements with plastic. The lower frame is a simple 1 mm carbon frame where each duct system is attached using 3 screws. For good impact resistance each blade protector has 5 branches. Unlike other Whoops, the TinyLeader has asymmetric X design. While the frontal motor-motor distance is 72 mm, the rear one is 52mm. This approach allows to push the camera forward providing clean FPV view (no props or other drone parts visible). Each 11000KV motor is connected to the ESC through a 3 position plug. 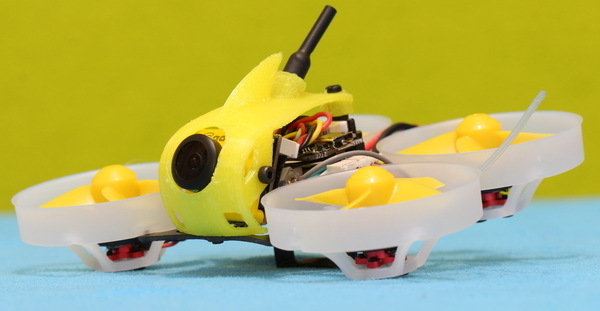 The tiny brushless motors are paired with 40mm/4-leaf propellers. Due to the high-power demand it comes with XT30 battery connector. While most of the electronics are 1-3s rated, FullSpeed suggest to use with their TinyLeader quadcopter with a 2s/300mAh or 2s/450mAh LIPO battery. The 3D printed battery mount limits you in shape/size of the battery. Replacing it with a rubber or velcro band will provide you more freedom in choice of LIPO. Similar to other Power Whoops, the FS TL is also equipped with the Caddx Micro F2 camera. 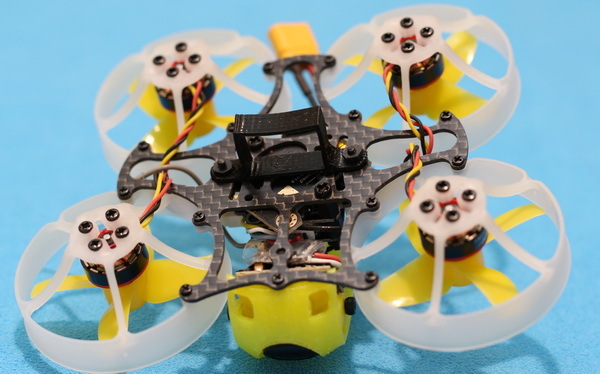 Caddx is a relatively new player in the racing quadcopter industry. 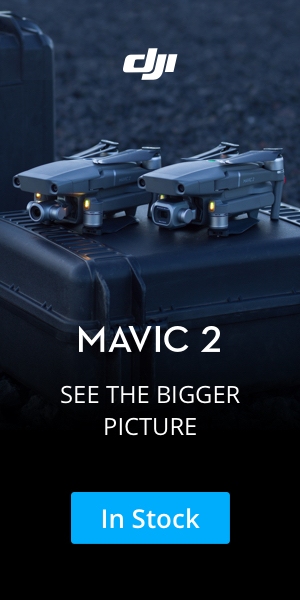 In the past they has been focused on security cameras and only recently started manufacturing FPV cameras. In addition to the low latency, the Caddx Micro F2 provides excellent video quality and fast response on light level changes. While the FSD TX600 video transmitter is capable to provide up to 600mW broadcast power, I suggest you to stay under 200mW. Higher power, not necessary means longer range. In most cases, increasing TX power will just reduce the flight time. For best range is very important to use a good quality diversity receiver, as well as to match the TX and RX antennas. Transmission power (blue LED), channels (red LED) and bands (green LED) can be adjusted via the VTX button, as well as remotely through your transmitter. By default, aircraft name, elapsed flight time and battery voltage OSD values are displayed on the FPV goggles. OSD screen can be customized through BetaFlight – Configurator. If you want to display RSSI info (RC signal strength), you will need to assign “RSSI channel” to “AUX 5” under the receiver tab (right corner). As it comes fully assembled and pre-tuned, there are not much to do prior first flight. Factory settings are well optimized for this little flying machine. After completing the binding procedure you just need to load a freshly charged battery and you are good to go. Firstly, I created a new model on my transmitter and named it “TinyLeader”. After that, under the “Model setup” screen, I set “Internal RF”, operation mode to “D8” and channels number to 8. Finally, I selected the “Bind” option. 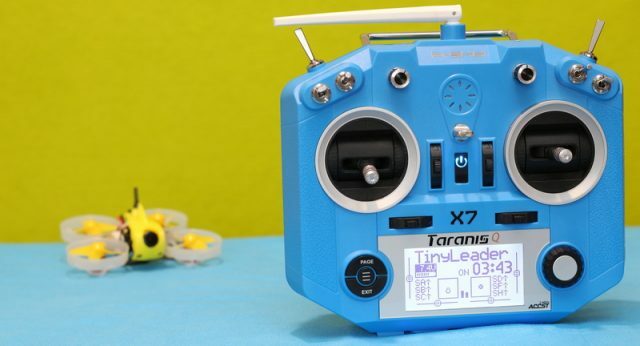 When the Taranis Q X7 is in “Bind” state, it makes a high-pitched beeping. Now, you can plug the battery (or the micro USB cable) while you hold down the FrSky-Nanon’s bind button (the receiver can be removed to have easy access on the F/S button). Successful binding will be confirmed by solid red and slowly flashing blue light. In just two hours after I receive it, I was ready to my first test flight. Firstly I played a bit indoor in angle mode. It is very stable and easy to control, the gyro does a great job. Despite its small size, it needs large open space in order to unleash its all power. You simply cannot compare the Tiny Leader to any brushed Tiny Whoop (eg Echine M80), the 2s makes it so much more powerful and nimble. Replacing the stock prop with a 2-leaf one, it would expect even more speed. I bet that with a 3s LIPO it would be turn into the devil it self :D.
The frame is very robust, I crash it few times and no visible damages. Anyway, is a great idea that you can replace the Whoop guards one by one. We hope the manufacturer will also offer spare parts. I have really enjoyed my time with the FullSpeed TinyLeader, is a great little quad which fly almost like its bigger brothers (of course excepting that you can’t hang on it a GoPro camera). All versions are available here with starting price of $119.99 (PNP – No radio) – this price includes free shipping. As battery is not included, you will have to spend couple of extra bucks for a compatible LIPO (GNB 2S 450mAh or 2S 300mAh). 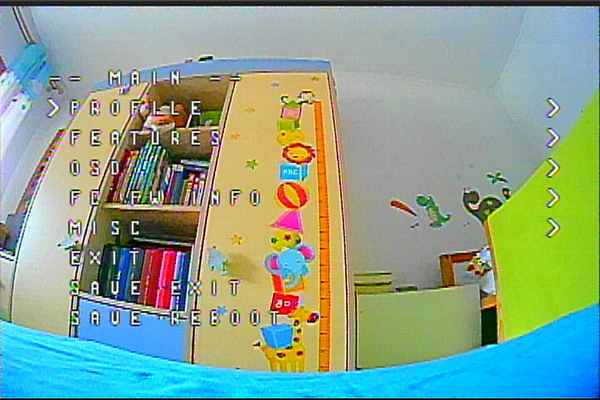 In case that you need on-board video recording you should look for the TinyLeader HD (aka CineWhoop). Compared to micro brushed Whoops, the FullSpeed TinyLeader has lots of power even on 2s. It is suitable for both indoor and outdoor fun. It is very durable, I crash it few times and it’s still like new. My only complain to FullSpeed, is why they could’t include at least one set of spare props and one flight flight battery. When you spend more than 100 bucks for such a small drone you expect a minimal pack of accessories. HD version is quite expensive. Let’s be fair, the FullSpeed TinyLeader is not a truly innovative quadcopter. You can find many similar micro brushless FPV drones on the marked. Just to name few of them: Happymodel Mobula7, Eachine Trashcan, LDARC Tiny GT7, SKYSTARS TinyFrog 75X, BETAFPV Beta75X and Spedix Rex. All of them adopts the same Whoop design enhanced by powerful brushless motors. 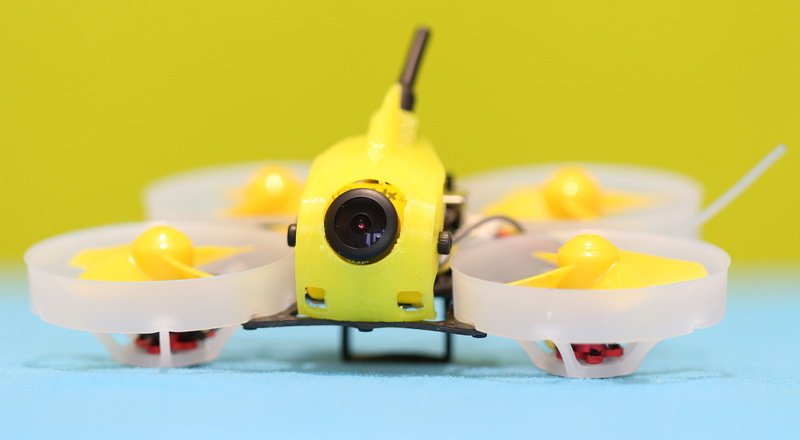 Both, Happymodel Mobula7 and FullSpeed TinyLeader are available in “HD” version with on-board video recording. They are also compatible with 2s as well as with 3s LIPO batteries.